Tienda Pago is a fintech company that finances short-term working capital for “tiendas” — small mom-and-pop grocery stores — in Peru and Mexico, so they are better able to manage inventory and cash flow. Such shops are generally too small to be able to access business loans from traditional financial institutions, and so can struggle to gather enough cash to pay suppliers up front to keep their shelves well stocked. The company already works with 12,000 shops in Peru, and 4,000 in Mexico. 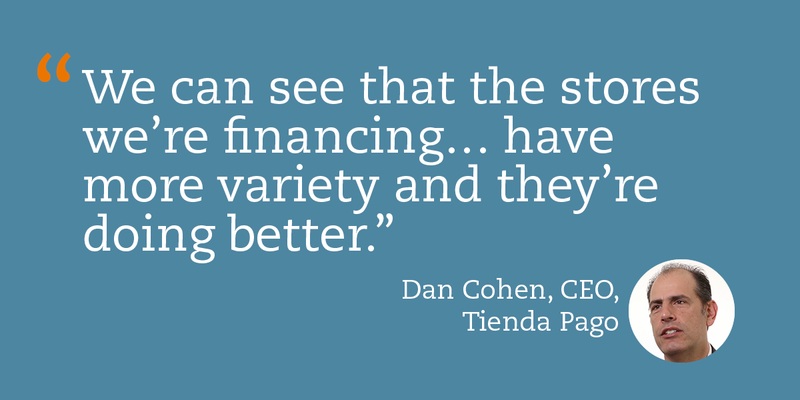 In this interview, Tienda Pago CEO Dan Cohen explains the model: “We finance [the shops’] inventory for their key products. We make agreements with large distribution companies and brands, to buy… those products for [the shops]. So now the store has a week to pay for those products, and we pay directly for the distribution.” He adds, “We can see that the stores we’re financing… have more variety and they’re doing better.” Some of the international and regional brands Tienda Pago has formed partnerships with include Frito-Lay, AB InBev, Coca-Cola, Movistar, and Gloria dairy products. One of the benefits Cohen has noticed in these family-run grocery stores is that younger generations are learning important early lessons in financial management. “The kids, because they also work in the store… understand the financial implication of having credit and being formalized into the financial system,” he says. Tienda Pago and Accion Venture Lab have partnered since 2016. For more on Tienda Pago, listen to the Accion Venture Lab VentureKast podcast interview with Dan Cohen or read this blog post about their model.